Why ‘very remarkable’? Because this seven-year-old female feline did not fit the ‘ferocious carnivore’ lion stereo­type, having been raised not on meat but on a diet of potatoes, green vegetables and cheesy pasta. Lea had in fact been nicknamed the ‘Spaghetti Kid’ after her favourite food, spaghetti, which she especially loved flavoured with Neapolitan sauce.2,3 And now the caretakers at her new home in South Africa were facing ‘the real challenge’, for the first time in Lea’s life, of introducing this ‘Spaghetti Kid’ to meat and to the companionship of other lions. Antonio introduces his beloved Lea to her new home—his dream to find her a new home has finally become reality. But the seven-year-old lioness must now face the challenge of learning to eat meat—for the first time in her life. After years of fruitless searching,5 eventually the way was clear for Lea to be sent to South Africa—Antonio would accompany her on the journey and remain at Lea’s new home for a few weeks to help her adapt. Given Lea’s distinctive nickname (‘Spaghetti Lioness’) and the publicity associated with her move to South Africa, many people got to hear of what Lea had eaten for the first seven years of her life—and were amazed. One journalist wrote: ‘Notwithstanding her strange diet she thrived.’ This lioness had not only survived (for seven years), but thrived on a meatless diet from infancy. But Lea is not unique in recent (lion) history in having successfully been raised on a meatless diet. A renowned vegetarian lioness in the USA did not eat meat at all during her entire lifetime.6,7 And many other animals normally regarded as being meat-eaters (e.g. dogs8, vultures9), are known to be able to live on meatless diets. To understand such a situation, we need to go back into history. 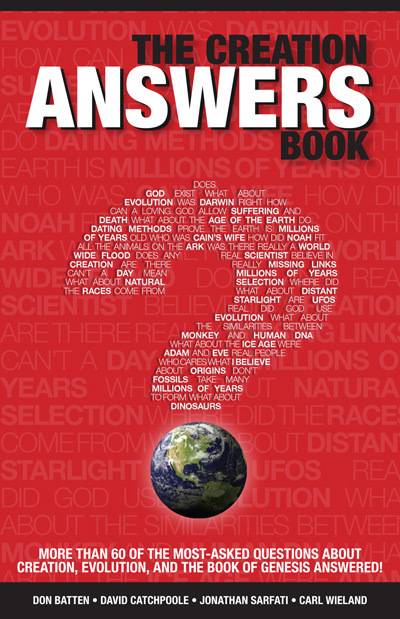 But which history is correct—evolution or the Bible? It just doesn’t make sense if one has an evolutionary perspective—that this is a ‘dog-eat-dog’ world, and that animals with sharp teeth, claws and beaks evolved over millions of years to be meat-eaters. 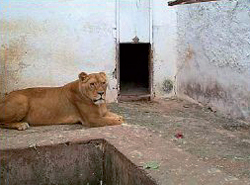 Lea in her Italian zoo enclosure. As Lea emerged from her transportation crate at her grassy new home, a crowd of camera-clicking reporters awaited the photo opportunity: Lea devouring her first South African meal of pasta, cheese and sliced tomato. But Lea took one sniff and walked away. As they say—you can travel the world, but there’s nothing like good old home cooking! Post Script: Lea’s new caretakers at The Rhino & Lion Nature Reserve have advised us that she was weaned from spaghetti in one week and now has ‘absolutely no problem’ with fresh red meat, which is fed to her—she does not hunt. Rhino & Lion Nature Reserve, <www.rhinolion.co.za/e-pics.html>, 23 February 2004. Return to text. WildNet Africa, Spaghetti-kid lioness to return to African roots, <wildafrica.net/articles/messages/32.html>, 20 February 2002. Return to text. 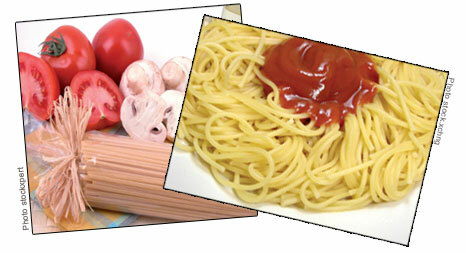 Neapolitan sauce is a meatless sauce made of pureed tomatoes with onion and garlic. Return to text. Kalahari Raptor Centre Newsletter, <www.raptor.co.za/Newsletters/Issues6.htm>, 20 February 2002. Return to text. There was plenty of demand from the ‘canned lion’ industry, which Antonio refused. (‘Canned lion hunts’ provide ‘game’—lions—that fee-paying trophy hunters can shoot.) Return to text. Westbeau, G.H., Little Tyke: the story of a gentle vegetarian lioness, Theosophical Publishing House, Illinois, USA, 1986. Return to text. Catchpoole, D., The lion that wouldn’t eat meat, Creation 22(2):22–23, 2000; <www.creation.com/lion>. Return to text. Derbyshire, D., Meat-free dog food for vegetarian pets, <www.telegraph.co.uk/news/main.jhtml?xml=/news/2002/09/16/wveg16.xml>, 3 February 2006. Return to text. Catchpoole, D., The bird of prey that’s not, Creation 23(1):24–25, 2000. Return to text. The Bible doesn’t detail how the change from herbivory to carnivory (and carcass scavenging) occurred after the Fall; perhaps divine redesign or the expression of latent genetic potential, predesigned in foreknowledge of the Fall. Thus, even if lions today did need meat to survive, it would not invalidate Genesis. See Batten, D. (Ed.) 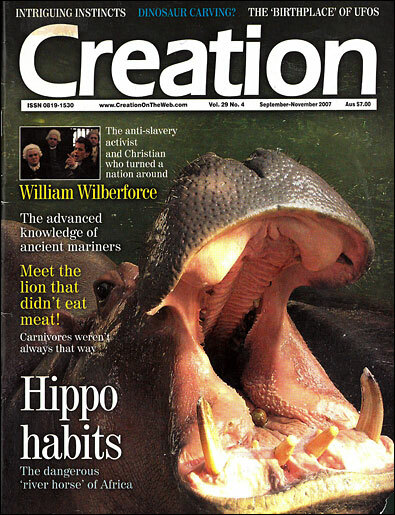 The Creation Answers Book, chapter 6, Creation Ministries International, Australia, 2006. Return to text.